Jakarta Book Club (JBC) was started in 2010 by Shirley Christie, a self-proclaimed nerd, and avid reader. Based on her own experience, she learned that books can be anyone's best friends – although, unlike friends, they do not have mood swings or dependency. Thanks to her supportive parents, she learned how to read and write at a tender age of five, even before she entered preschool. She started reading anything – from The Holy Bible to One Thousand and One Nights – and published her first short story in a local newspaper when she was nine years of age. She embraced her curiosity by reading more books and worked in her school and university libraries. She won a number of writing competitions, thanks to many references she picked up from books. However, finding a reading companion is not as easy as it may seem, and therefore this book club was created. In 2010, there were already a few book clubs flourishing in Jakarta, even though they are quite distinct and distant from one another. Jakarta Book Club started its meeting in a narrow space between hundreds of books and stationary sold at Kinokuniya, Plaza Senayan, in South Jakarta. At that time, the book club focused on nominating several books and encouraged two dozen members to read the selected book within a limited period. The challenges were to maintain a steady level of attendance and finish the book at the same time. The difficulty in juggling this with a full-time job as a journalist became an unfortunate reason for Shirley to put the book club into a hiatus. A year later, she met Ollie, a book author who co-founded a self-publishing company Nulisbuku.com, at a start-up networking event in Jakarta, and they traveled together on a memorable business trip where they got to visit some of the largest libraries in Dublin, Ireland. After keeping in touch for several years, they finally sat down for coffee and decided to join their forces to reignite the book club that already had nearly 1,000 followers on social media at that time. 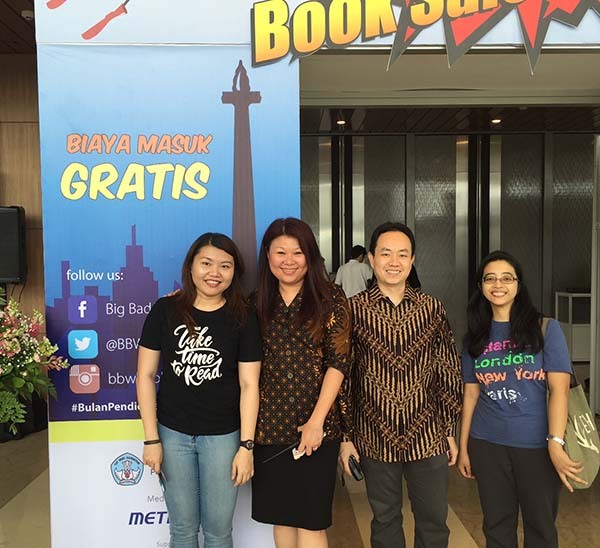 Jakarta Book Club made a comeback in November 2014, with a new format of hosting a monthly meetup and following a different theme each month. Most of the attendees are generated from Meetup.com, where JBC has over 2,100 members as per March 2017. We have around 25-40 active members attending our meetup each month. All events conducted by JBC is currently free of charge and mainly supported by its officers (Shirley, Dina, and Ollie). If you wish to get more information or give a donation to support our activities, please contact shirley@jakartabookclub.com. Follow Jakarta Book Club on Twitter, Facebook, and Meetup.com.